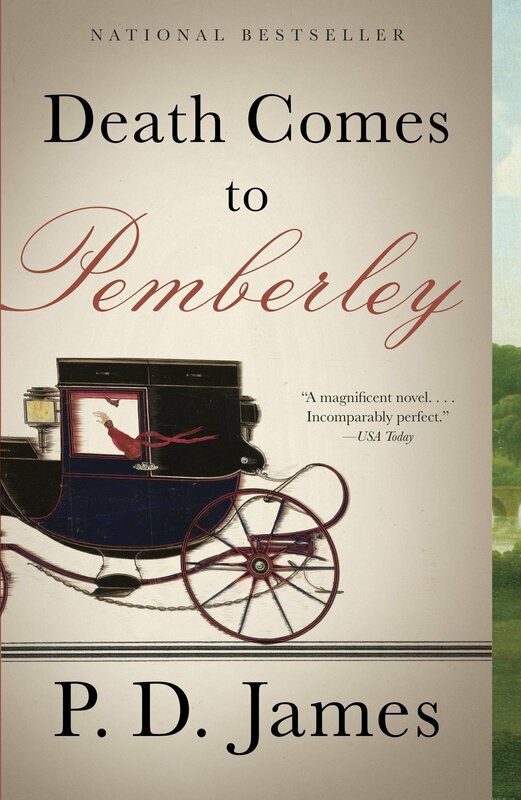 Death Comes to Pemberley By P.D. James Review! Death Comes to Pemberley (2011) by P.D. James is a wonderful mystery adapted from Jane Austen’s Pride and Prejudice. I absolutely adore this novel. It combines two of my favourite reading materials in murder mysteries and Jane Austen. Kudos to James for dreaming up such a wonderful and intriguing plot. Very clever and creative idea. She also has written the book very well. As a Jane Austen fan I appreciated the way her writing in this book was so like Austen’s. She clearly researched Austen’s style of writing very well and that helped the cohesive feel of the novel as a continuation of Austen’s most well-known book. The mystery itself is also great. Right up to the end I didn’t figure out who the guilty party/parties was which is fantastic for a mystery. The book is quite long but it is engaging and engrossing. It holds your attention very well. There is many suspects but James shields the killer/s very well which makes for a great read. Alongside the mystery there is a historical drama very much in the style of Austen. The combination of the two is amazing and through the two sides of the story we get a great insight into what the characters are like. This book has had many negative reviews. I suppose James was always going to fall short taking on a classic author like Austen in the eyes of many Austen fans. It was certainly a huge challenge she set herself but I personally think she pulled it off. I found it a really good read and it was lovely to see Elizabeth, Darcy and co in action again. A great read for James and Austen fans. The Jane Austen Book Club By Karen Joy Fowler Review! The Jane Austen Book Club (2004) by Karen Joy Fowler is an entertaining and light-heartened read. As a huge Jane Austen fan, I found this book a joy to read. It follows a Jane Austen book club in Davis, California as they read her six classic books and along the way we get to know about each of the characters and their lives. There is a great variety of characters with varying perspectives on both life and Jane Austen books which makes for a very intriguing plot. In the club we meet Jocelyn who founded the book club. She has been friends with Sylvia since they were 11 and brought Sylvia and her husband Daniel, who Sylvia is now getting a divorce from, together. She loves dogs and breeds Rhodesian Ridgebacks and has never married/cohabitated, fell in love or became a mother. But now in her fifties her selfless streak and love of romance and bringing couples together starts her on a mission to get Sylvia together with the only man in the club Grigg, a man in his 40s who is wonderfully nerdy and met Jocelyn first outside a science fiction convention. However there is chemistry … only it’s between Jocelyn and Grigg instead. Sylvia’s and Daniel’s daughter Allegra who is 30 and is an artist and all-round adventure seeker, is also in the club and much like her mother is going through some romantic struggles in her life as she has left her girlfriend Corinne and moved back in with her mother. The youngest in the club is Prudie who is 28. She is a French teacher in a high school and is married to Dean but she is also having romantic problems and begins to become attracted to one of her students. And from the youngest to the oldest member of the club, we meet yoga lover Bernadette who is 67. Married many times, Bernadette is totally chilled out and loves a good natter. I have to say that the idea of a book club to any reader is a brilliant starting point. It’s very easy to relate to for anyone who loves reading even if it isn’t Jane Austen books they like. So that was a clever idea. My favourite character was Allegra because I could relate a lot to her (adventure seeking in sky diving and rock climbing aside!) but I also liked Grigg. But I liked them all and they are a great mix of characters together and their interactions are great. There is a bit of everything in this book from romance to comedy and Jane Austen and even a bit of sci-fi book recommendations from Grigg. I absolutely loved it. An interesting fact that I read about this book is that in 2004 it was published on April 22nd which was my 14th birthday. So that was cool. Included in this book is a guide to the novels, a collection of opinions on Austen’s work and questions for discussion from each of the characters. All of these pieces were very interesting and kept with the book club theme.